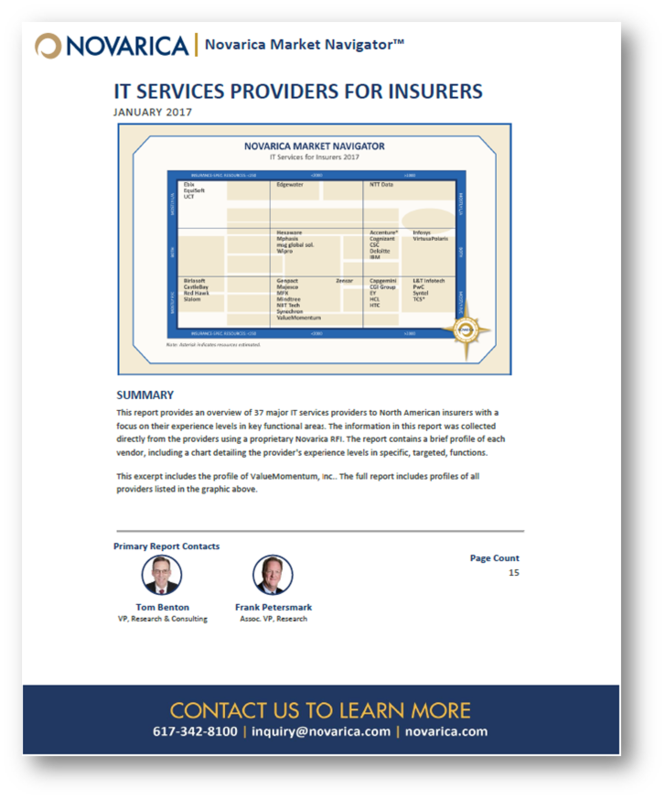 The report, an authorized excerpt of the Novarica Market NavigatorTM: IT Services Providers for Insurers provides an overview of major IT services providers to North American insurers with a focus on their experience levels in key functional areas. Novarica profiled ValueMomentum Inc. as one of the 37 major IT services providers included in the report. The reprint contains a brief coverage of ValueMomentum's IT services offerings and its key differentiators like deep insurance expertise and focus on developing tailored solutions. The report includes a chart detailing ValueMomentum's insurance resources and current ADM & Non-ADM clients in the North American region. Gain insights into ValueMomentum's full range of IT services offerings for North American insurers and the key service differentiators. 2019 © Copyright ValueMomentum All Rights Reserved.